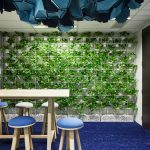 IA Design was engaged by Acorpp on behalf of Alinta Energy to deliver Alinta Energy’s new workplace over two floors within Raine Square in Perth. Alinta’s previous fitout was fragmented, with staff over three different floor areas. This had resulted in cultural disconnection and siloed working groups. IA Design worked alongside Acorpp to define a workplace strategy which resulted in the alignment of the organisation’s vision and values with the drivers for the new work environment. Accommodation Questionnaires and briefing sessions with all departments were held, allowing the wider business an opportunity to explain their functional requirements and also their aspirational desires for the new workplace. 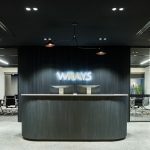 Openness, transparency and professionalism were agreed as the desired outcomes from a client perspective with a warm, welcoming and social workplace from a staff perspective. A fully glazed open stair connecting both floors created a central hub which is collocated with staff breakouts on each level. This forms the social spine of the tenancy. Various options for acoustically private spaces supportive of focused work were included such as phone booths, focus and huddle rooms. A suite of meeting rooms of varying capacities are located at the front of house. Open collaboration spaces include traditional meeting spaces at work points, lounge type seating areas, flexible project rooms as well as a flexible space which can cater for the entire business for monthly town hall functions. Wellness and sustainability were important to Alinta. Generous natural planting was employed to improve air quality, with reuse of existing furniture, some built environment and base building finishes supported the sustainability initiative.